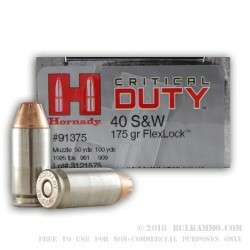 Hornady Critical Duty® ammunition utilizes several of their patented designs to bring you a round that will deliver reliable, terminal performance. Their FlexLock® bullet design delivers matchless barrier penetration. The INTERLOCK® band has been proven to maintain maximal weight retention through all FBI test barriers, while the high-antimony lead core and Flex Tip® design produce dependable expansion. These rounds deliver terminal performance through all the FBI protocols and are great for those using a full-sized weapon for self-defense. These .40 S&W are loaded with a 175-grain FlexLock® projectile and are loaded into noncorrosive, boxer-primed, nickel-plated, reloadable brass cases. They are also loaded with low flash powder for use in lowlight situations and come 50 rounds to a box, 10 boxes to a case. Using only the highest quality components for their casings and bullets, Hornady’s goal is to create a more accurate, reliable round, no matter the situation. Since 1949, American-made Hornady has created high-performing reloading supplies and ammunition in their Nebraska facility and has forged a reputation for quality, American-made ammunition.